ABBA is one of the most divisive bands on the planet. This is odd considering they are also one of the most successful bands on the planet. The “art loving” crowd, no doubt, considers the band to be the lowest of the low. Nothing but absolute cotton candy fluff material that never once speaks to the higher cause of man. The lyrics are crappy, the music is gasp danceable (and even disco) and the band’s image as smiling, vapid goofballs couldn’t be less attractive to those who care about art. I actually completely agree with both sides but with reservation. Yes, many great acts have sold millions of albums. The Beatles have sold more albums than anybody this side of Elvis and they were the most influential, important and worthy pop rock band of all time. But then again, artists such as Justin Bieber (who I hate to pick on because it’s too easy but whom serves a purpose here) sell just as many millions of albums but whom has no respect or love from critics. The problem with the “artists that sell millions are worthy” argument is that unworthy artists sometimes sell a lot of albums. However, how long do you remember bands that are unworthy, no matter how many albums they’ve sold? Quick! Anybody raised in the 90’s, I want you to answer this question: who wrote “Closing Time”? What band was that? Or who wrote “The Freshmen”? I’m sure that many readers could remember the song but not the artist. That’s understandable: those bands had one hit apiece and were absolutely forgotten afterwards. Okay, 90’s kids, tell me who wrote “Smells Like Teen Spirit.” Naturally, almost everybody with a brain knows that Nirvana wrote that song. And critics adore Nirvana as does a wide portion of 2000’s kids. Here’s one for the 70’s and 80’s kids: who wrote “Saturday Night”? I’m sure some of you will remember who that was: it was the Bay City Rollers. However, how many of you had to really think about it before you answered? You had to hum the song, if you could remember it and think of the stupid looking band playing their dumb song live. Okay, last question before I move on: who wrote “Dancing Queen”? “SOS”? “Knowing Me, Knowing You”? “Fernando”? “Take a Chance On Me”? I’m sure most people from those time periods who listened to pop radio knew immediately the answer: ABBA. And this is why ABBA was actually an incredible band, a band that I actually think was the best pure pop band of the 70’s, perhaps of all time. In their prime, these four weird Swedes recorded more instantly recognizable songs than any other band during the same time. They basically conquered the world, commercially, becoming one of the biggest bands of all time. They’re still internationally renowned. Musicals get written using only their music and make it big. There are a few reasons for this: musically, the band was weirdly diverse. Their albums include an odd mix of folk, pop, funk, disco, dance, prog rock, rock and roll, synth pop, classical stylization, vocal jazz, Broadway ballads and more. Benny and Bjorn, the two guys, had an almost unparalleled ability to blend these styles to their will, mix them in a pop and create a cohesive sound that was not only listenable but universally understandable. 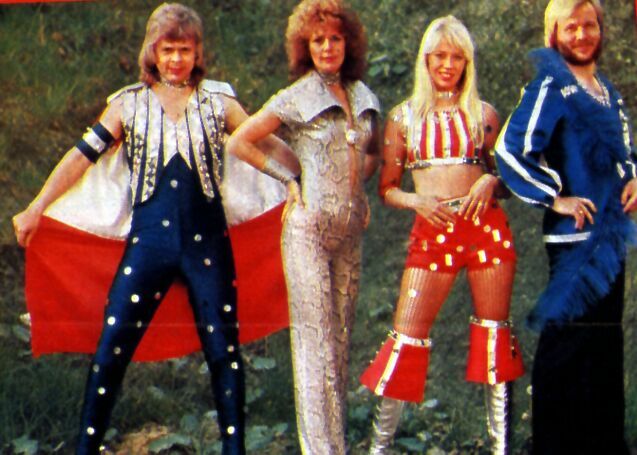 The basic gambit of ABBA, musically, was to combine all of these styles with pure pop songwriting sensibilities. And these two guys were untouched in writing pure pop. Their song structures featured introductions, verses, choruses, bridges, solos and everything else a great song should feature. They were built on instantly memorable guitar and keyboard riffs. Choruses, verses and bridges all had distinctive melodies that fed off of each other and made nearly every song a mini-pop symphony. Keys, rhythms, time signatures and harmonies changed at the drop of a hat but always in the most effective manner. Nothing was arbitrary or pointless. Take a listen to a song like “The Name of the Game” and tell me the band didn’t understand how to string together seemingly unrelated musical phrases seamlessly. That said, that band would have been nothing without Agnetha and Frida. Benny provided occasional backing voices while Bjorn provided more extensive harmonies and occasional leads. However, their voices are thin and dorky sounding. They were best at writing, playing amazing keyboards (Benny Anderson is an absolutely, criminally underrated keyboard player, coming up with amazing chords, tones, solos and playing in every style), solid guitar work (Bjorn almost always played basic rhythm while the other guitarists in the band played the hard stuff) and lyrics (mostly Bjorn’s aspect in the band). Agnetha and Frida, simply put, had two of the best singing voices in the business in the 70’s. Agnetha was the blonde with the higher pitched voice who tended to sing lead. Frida was the deeper voiced singer who sang occasional lead. Both had intense power, tenderness, range and stylistic abilities. Sure, their singing often sounded stiff and weird (as they barely spoke English) but they were often able to power through that with raw power. But the girls were really only at their most effective when they sang in unison. Not normally a fan of unison (or harmonized in this case) singing but there was something close to magic when these two sang together. The slight tonal differences complimented each other perfectly and when the two sang together, they harmonized in such a way that a magical “third voice” often came up out of nowhere. It’s hard to explain, but listen carefully to them again and you’ll hear what I mean. However, ABBA is not a band without some serious problems. One of these problem is the band’s serious lack of “edge.” True, a band doesn’t need an edge to be good but the band is an incredibly dorky presentation that can be hard to take seriously. And although they do try to “rock out” from time to time, well, those attempts are as poorly realized as you’d expect. Another serious problem is the band’s lack of emotional depth. Their first six albums lack any serious deep, cutting moments. Yes, the band fakes it well during these albums but always with big, dopey cheery grins. You can never really take these “sincere” moments seriously. The band didn’t really focus on creating solid, emotionally charged music until their last two albums. But these emotionally charged moments are highly sabotaged by the lyrics. On one hand, I don’t want to be too hard on ABBA because they were a Swedish band writing and singing lyrics in a language they barely understood. In fact, the band had to get serious help from manager Stig Anderson in this department for most of their career. On the other hand, bad translations can’t be blamed for the triteness of 99% of ABBA’s lyrical messages. Songs like “King Kong Song” are so batshit stupid that it’s hard to believe the band took them seriously. As poetic texts, most of them get F’s and earlier lyrics sometimes get no higher than C- or D+ as pop lyrics. The band’s lyrics did get better on their last two albums (Bjorn seemed to finally get the knack for expressing himself in the English language) but that isn’t saying much. Both of those albums get C+’s at most as albums, sometimes a bit higher but never getting above a B-. That said, the band does get extra points for consistency: all but their first two albums are among the highest quality pop in the world during the 70’s and a few are some of the best pop (pure pop, remember) albums ever recorded. The band’s trademark care for their singles actually extends to album tracks. Sure, there can be cheesy moments or slightly less engaging songs, but the band seemed to do their best to pack each song with as many instantly memorable hooks as possible. I honestly believe that anybody who is serious about pop music should consider checking out or re-evaluating ABBA’s worth. Yes, you might not need EVERY album the band wrote. None of their albums are absolutely essential (although you’d miss a few gems by skipping out on their best albums). A casual fan could pick up the classic “ABBA Gold” or even the slightly bulkier “Essential Collection” or even the “Thank You For the Music” box set. On to the reviews! Not really making a point with this picture. Just felt like showing it.